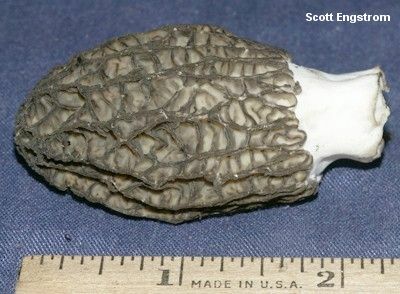 Morchella septimelata is a burn-site morel from western North America, defined by its DNA sequences, apparently identical in physical features to Morchella sextelata. 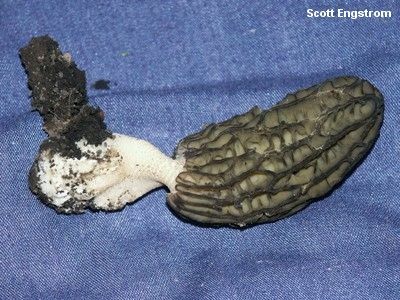 Both species are "black morels," which means that their ridges darken with maturity, their pits and ridges are primarily vertically oriented, and their caps are attached to the stem with a small but noticeable groove, and both species are apparently limited to conifer burn sites. There do not appear to be any consistent difference in physical features. Honestly, I wish we could let the morphology trump the DNA and just fold these two phylogenetic species into one morphological species. But while that approach is sometimes taken when species are very closely related, Morchella sextelata and Morchella septimelata aren't even that close--in fact, according to the four-gene testing done by O'Donnell and collaborators (2011), Morchella septimelata is more closely related to Morchella species mel-8, Morchella capitata, and Morchella importuna than to Morchella sextelata . . . so we would have to fold all of those species into one superspecies that would be morphologically and ecologically incoherent, since some of the mushrooms in question look very different, and/or do not inhabit burn sites. 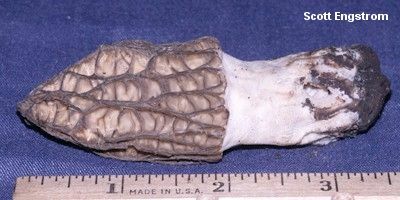 Unlike Morchella sextelata, Morchella septimelata does not reliably reveal itself through basic RFLP analysis of the ITS region--which means that the expensive and time consuming four-gene sequencing routines used by O'Donnell and collaborators (2011) must be used in order to identify it with precision. 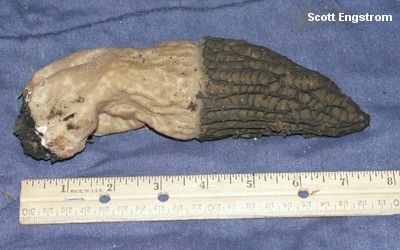 Perhaps it should have been named Morchella gluteomaximodolorosa. 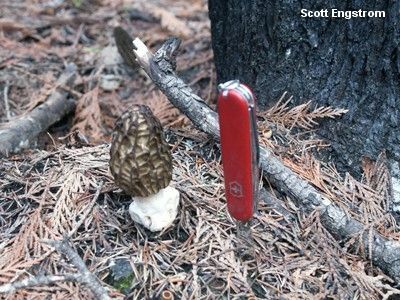 Ecology: Possibly saprobic and mycorrhizal at different points in its life cycle; appearing in lightly to moderately burned conifer forests in western and northwestern North America, often near creek beds and seeps, in the spring or summer following the fire; documented from Montana, Oregon, and British Columbia. Cap: 4-10 cm tall and 3-7 cm wide; conical or nearly so; pitted and ridged, with the pits primarily arranged vertically; when young with bald or finely velvety, bluntly flattened, brownish ridges and olive, brownish, or pinkish pits; when mature with flattened to sharpened or eroded, dark brown to black ridges and brownish to tan pits; attached to the stem with a small groove (1-3 mm deep); hollow. Stem: 3.5-10 cm high and 2-5 cm wide; equal, or somewhat swollen at the base; whitish to brownish; finely mealy with granules; hollow. Microscopic Features: Spores (17-)18-25(-30) x 10-15(-20) µ; smooth; elliptical; without oil droplets; contents homogeneous. Asci 8-spored. 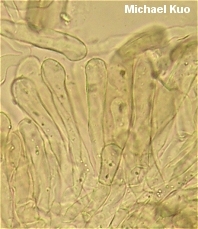 Paraphyses cylindric with subacute or subfusiform apices; septate; hyaline in KOH. Elements on sterile ridges 60-200 x 7-18 µ; septate; brownish to brown in KOH; terminal cell clavate (rarely subcapitate or irregular). SPECIMENS EXAMINED: Herb. F. 04040402, 04300401, 05160401, 06150401 (topootype), 06150404 (holotype), 06150408, 06150410, 06180417, 07070401, 07070408, 07140404. Kuo, M. (2012, October). Morchella septimelata. Retrieved from the MushroomExpert.Com Web site: http://www.mushroomexpert.com/morchella_septimelata.html.